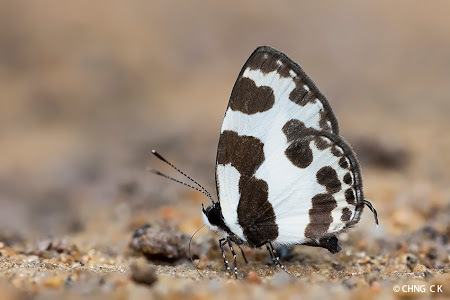 The Elbowed Pierrot is a small black-and-white butterfly that flies mainly in the forested nature reserves of Singapore. It flies fast and erratically, usually at low level, searching for food along open footpaths and clearings. It also likes to perch on thin twigs to rest amongst the shrubbery. It is quite a rare sight to see this species open its wings to show the upper side of its wings. This species is partial to decomposing organic matter on the forest floor, and readily puddles when it finds such a food source. This shot, taken by ButterflyCircle member Chng CK, shows a typical puddling Elbowed Pierrot.